Maeve Anna Higgins (born 24 March 1981) is an Irish comedian from Cobh, County Cork, currently based in New York. 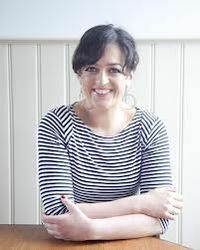 She was a principal actor/writer of the RTÉ production Naked Camera, as well as for her own show Maeve Higgins' Fancy Vittles. Her book of essays We Have A Good Time, Don't We? was published by Hachette in 2012. She wrote for The Irish Times and produces radio documentaries. She previously appeared on The Ray D'Arcy Show on Today FM. Higgins started up in comedy in 2005 and has written and performed at many festivals and shows. She began her comedy career on national radio station Today FM after auditioning on The Ray D'Arcy Show in February 2004. She failed to win. From 2005 to 2007, she took part in the hidden camera show Naked Camera with fellow comedian and friend PJ Gallagher. She landed her own television show, Maeve Higgins' Fancy Vittles, in 2009. Since 2010, she has occasionally been performing with Josie Long and Isy Suttie. ‘I Can’t Sleep’, a children’s play written by David O'Doherty. Higgins performed this skit with O'Doherty at the Edinburgh Festival Fringe. 'A Rare Sight' at the Brisbane Comedy Festival and Melbourne International Comedy Festival. Performed with Nick Coyle. 'A Rare Sight' at the New Zealand International Comedy Festival. Nick Coyle could not attend due to surgery on shoulder. 2015: StarTalk with "Neil deGrasse Tyson"
Higgins received widespread criticism from disability campaigners when she revealed on 30 March 2018 on the Irish Late Late Show that she purchased a Service dog vest on Amazon and pretended that her pet dog was a service dog for a trans-Atlantic flight. She subsequently apologized for her actions. ^ Higgins, Maeve (1 April 2018). "The Luck of the Irish". The Progressive. Retrieved 17 April 2019. ^ Leonard, Sue (10 November 2012). "Beginner's Pluck – Maeve Higgins". Irish Examiner. Retrieved 17 April 2019. ^ "Valentines Bones". Documentary on One. RTÉ Radio 1. Retrieved 17 October 2018. ^ "What would Maeve do?". Today FM. Archived from the original on 10 November 2008. ^ Hynes, Liadan (28 May 2006). "'Bridezilla' and the art of making people laugh". Sunday Independent. Retrieved 26 December 2008. ^ a b c "Naked Camera". RTÉ Press Centre. 2 April 2007. Retrieved 17 April 2019. ^ a b c "Maeve Higgins' Fancy Vittles". RTÉ Press Centre. 19 September 2009. Retrieved 17 April 2019. ^ "I Can't Sleep by David O'Doherty". Edinburgh Festival. 13 August 2008. Retrieved 17 October 2018. ^ "'Wait Wait' For Sept. 8, 2018: With Not My Job Guest Jenny Han". Wait Wait...Don't Tell Me!. NPR. 8 September 2018. Retrieved 18 October 2018. ^ "'Everything is Alive: Maeve, Lampost'". Everything is Alive. Radiotopia. 31 July 2018. Retrieved 27 October 2018. ^ Hopkins, Jacqueline (5 April 2018). "Anger as comedian Maeve Higgins claims 'assistance dog' for flight". Irish Examiner. Retrieved 15 August 2018. ^ Walsh, Niamh (8 April 2018). "RTÉ receives slew of complaints over Late Late Show Maeve Higgins interview". Evoke.ie. Retrieved 15 August 2018. ^ Lanigan, Michael (8 April 2018). "Maeve Higgins apologises after saying she faked a disability to bring her dog on a flight". JOE.ie. Retrieved 15 August 2018. This page was last edited on 17 April 2019, at 11:41 (UTC).